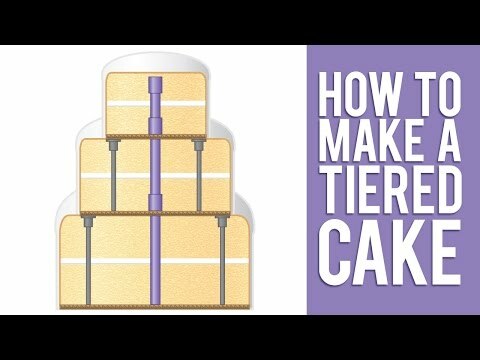 Bake in the center of the oven – the smallest tier should take 2 1/2 hours, the middle tier 4 hours and the largest tier will bake for 6 hours. 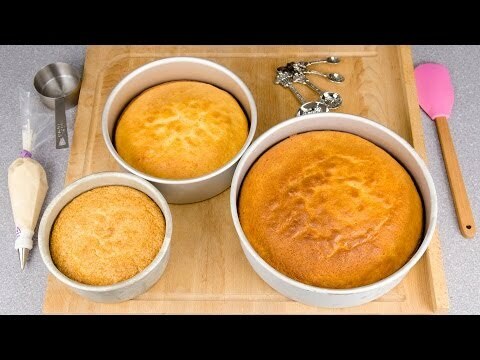 Test the cake about 15 minutes before the end of the recommended time, by inserting a skewer in the center of the cake. If the skewer comes out clean the cake is cooked, if not return to the oven and re-test in 15 minutes. When cooked, remove from the oven and leave to cool in the tin. To cover the cake board with sugar paste icing, dust the cake board with icing sugar and then brush with a little water to help secure the icing to the board. Lightly dust the work surface and rolling pin with sifted icing sugar. 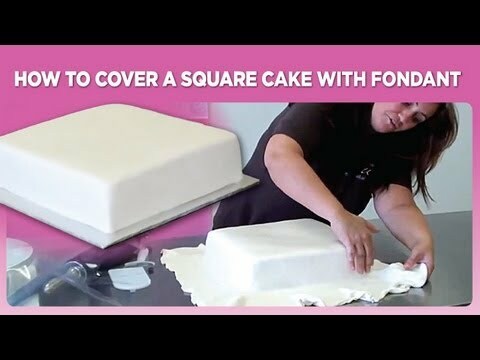 Take about 250g sugar paste icing, and roll to a thickness of 3mm and large enough to cover the cake board, you may need more if you are using a larger board. Using the rolling pin, lift the icing and ease onto the cake board. 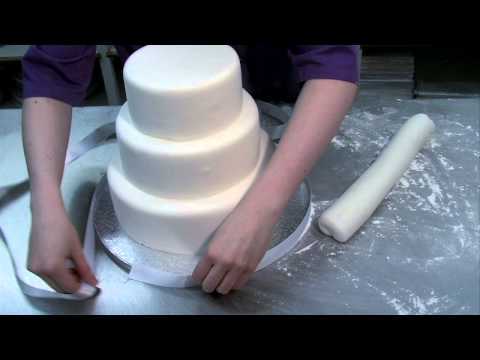 Use your hands to smooth the icing into place, making sure there are no air pockets. 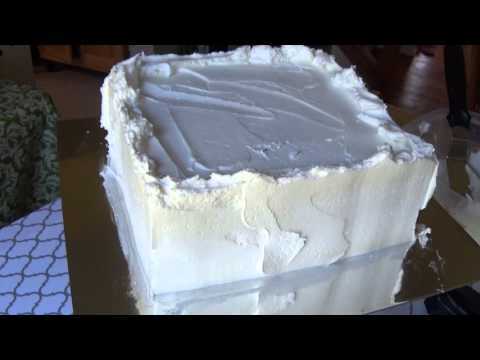 Using a knife or a cake smoother, ease cut the icing around the edge of the board. If possible leave to dry of 1 to 2 days. Once the icing is dry cover the edge of the board with a ribbon, fixing the ends with a pin. To build up the tiers on your wedding cake, cut out a template the same size as the second layer and sit in the position of the second tier. Mark each corner with a needle. 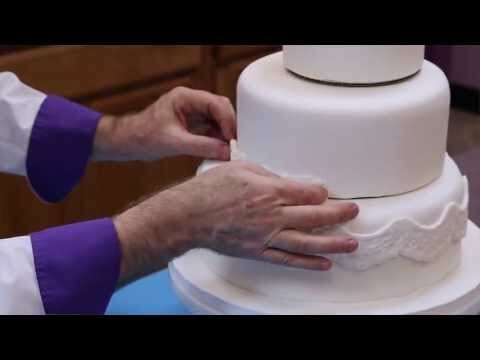 Push a plastic dowel into the cake and mark with the dowel with a pencil indicating where it comes out of the cake. Lift out of the dowels and trim the dowels about 1-2mm above the mark then stick them back into the cake. Pipe some royal icing onto the center of the bottom tier to secure the second tier. Carefully place the second tier onto the bottom one. Mix some icing to match the colour of the cake icing and pipe a thin line along the bottom edge of each tier. While wet run a finger over the line to smooth the icing and fill any gap between the two cake layers. A ribbon and also be added here to hide any unevenness that may appear. To make the spotty shapes, lightly dust a surface with icing sugar and roll out coloured sugar paste icing and cut spotty shapes – either use small cutters or the end of a piping nozzle. Pipe a small amount of white icing onto the fondant shape and use to stick the shapes to the cake. For the piped dots, place a plain nozzle in a piping bag. Fill with the icing, twist and hold in your writing hand. Squeeze the icing at the top of the bag to make it flow through. The icing should be smooth, soft but still with a little resistance. To make dots, hold the bag vertically with the nozzle close to the surface, squeeze a little icing out to make a dot the desired size, then to finish, stop squeezing, push down and then draw up sharply. If the dot has a little peak flatten carefully with a damp knifepoint or paintbrush.